The increase in mortgage debt may may influence labor-force dynamics, prompting older Americans to delay retirement. (Bloomberg) — Mortgage-burning parties in the U.S. may be going the way of home milk deliveries and polyester leisure suits. A growing number of homeowners are reaching retirement age still owing money on their houses. The share of Americans 65 and older with mortgage debt rose to 30 percent in 2011 from 22 percent in 2001, according to a May analysis by the Consumer Financial Protection Bureau based on the latest available figures. Loan balances also increased, with the median amount owed climbing to $79,000 from $43,400 after adjusting for inflation, the data showed. The increase in mortgage debt may influence labor-force dynamics as some older Americans find they’re unable to completely retire, needing extra cash to keep up monthly payments. It also diminishes home equity and wealth, making these households more susceptible to swings in the economy and curbing spending on things such as vacations and visits to grandchildren. A surge in refinancing in the early 2000s — and to some extent the more recent wave in the post-recession years — is one reason mortgage debt grew, according to a 2012 analysis led by John Gist, a professor at George Washington University’s public policy institute in Washington. In addition, the ability to buy with smaller down payments during the housing boom and the acquisition of vacation homes also contributed. Leo Zawacky, 65, and his wife took out a 30-year mortgage in 2003 to buy a duplex a mile from the ocean in Atlantic Beach, Florida, and added a home-equity loan a few years later. Those became harder to service when Zawacky lost his job as a carpenter amid the housing crisis and was forced into retirement in 2008 when he couldn’t find work. The couple uses Social Security and disability checks to make payments on the two loans. They haven’t sold the house because, Zawacky said, it’s home. “It is stressful to have that hanging on us, but we try very hard not to let it bother us,” said Zawacky, who makes wood-burning crafts with his wife to sell at local arts shows and supplement their income. Still, “we can’t do a lot of things we’d like to do,” including visits to family in North Carolina. The job market hasn’t been kind to older age groups, which makes servicing debt more difficult. The median duration of joblessness for adults 65 years and older was 17.8 weeks in July, versus 13.5 weeks for those 25 to 34, Labor Department data show. Having a mortgage is “a source of risk for these older households, particularly when you see what we find in the labor market experience,” Julia Coronado, chief economist at Graham Capital Management in Rowayton, Connecticut, said in a May presentation hosted by Wharton’s Pension Research Council. Those with jobs are laboring longer. 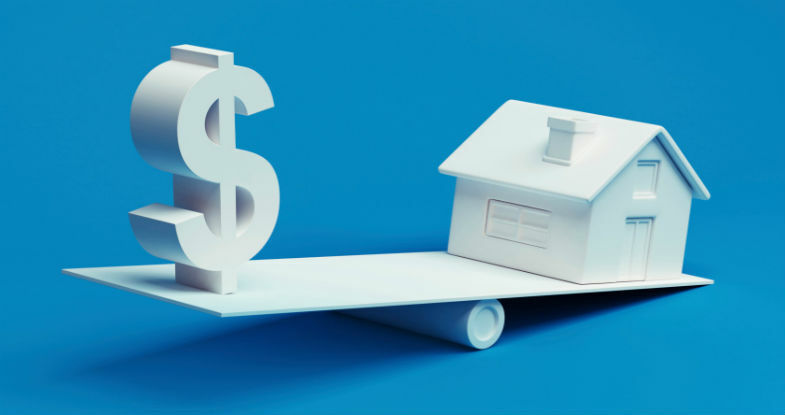 About 65 percent of homeowners with mortgages are still working at age 64, compared with 54 percent of those without housing debt, according to a December analysis by Washington-based Urban Institute researchers Barbara Butrica and Nadia Karamcheva. Greg Frost, founder of Frost Mortgage Banking Group in Albuquerque, New Mexico, said baby boomers will probably be the first generation to take advantage of reverse mortgages on a large scale. “No mortgage payment for the rest of your life — it’s a beautiful thing,” said Frost, 65, who plans to take one out on his two-story adobe home in about two years. He and his wife don’t plan to downsize because the property, which boasts a swimming pool and guest house, suits their needs. At its simplest, the trend may just reflect a shift in priorities among Americans toward being less averse to mortgage debt, said Donald Frommeyer, president of the National Association of Mortgage Brokers. Baby boomers don’t “have the same desire to pay it off as the generation that went through World War II,” he said. Frommeyer, 60, and his wife aren’t among them. The pair is just two months shy of making the final payment on the home in Indianapolis they built in 1997. His wife asked about getting a copy of the mortgage note so they could celebrate by burning it, but now “all they send you is this paid receipt,” Frommeyer said. The inclination toward having bigger mortgages later in life will probably not dissipate with the coming of a younger generation. As millennials delay buying homes, they may prolong the trend, said Sam Khater, deputy chief economist at mortgage and real-estate information provider CoreLogic Inc. The homeownership rate for Americans 35 years old and younger fell to 35.9 percent in the second quarter, the lowest level in quarterly data going back to 1994, according to the U.S. Census Bureau. That compares with a high of 43.6 percent 10 years ago.